This technote describes the design of the LSST Science Pipelines Documentation. As this design is implemented, this design documentation may not be updated. Developers and writers should see the DM Developer Guide for up-to-date information, particularly on how to write different types of documentation topics. This document remains useful for describing the design motivation behind the documentation system. The LSST Science Pipelines are a key project in the LSST Data Management System. DM developers, data release production operators, and the LSST astronomy community at large all have a stake in using and extending the Science Pipelines. Comprehensive and usable documentation is prerequisite for the success of these stakeholders. This technical note describes a design for the LSST Science Pipeline’s user guide. The initial design was developed by the authors at a design sprint held in Tucson, AZ, over December 7 to 9, 2016. As the documentation design is implemented and improved, this technical note will be updated and serve as a reference for the project’s design philosophy and direction. The LSST Science Pipelines documentation is implemented consistently with LDM-493 Data Management Documentation Architecture’s user guide project class. The meeting notes are archived with this technical note as a PDF, and also available online at http://ls.st/507. The design is presented as follows. In Section 2 we define the scope of the LSST Science Pipelines as a software and documentation project. Section 3 describes the audience of this documentation project. Section 4 lays out the docs-as-code technical framework within which the documentation is produced and delivered. Section 7: Processing topic type. Section 8: Framework topic type. Section 9: Module topic type. Section 10: Task topic type. Section 11: API reference topic type, including a discussion of prototypes. One of the basic questions our design sprint needed to address was what is the scope of pipelines.lsst.io? Typically this question is defined by a product marketing team, or by a source code repository (for instance, https://docs.astropy.org is documentation for the https://github.com/astropy/astropy software project). In our case, the situation is complicated by the fact that Data Management software is being built by multiple teams across many coupled repositories. Taken together, the software repositories of the Data Management System are typically called the Stack, but not all parts of the Stack are used together. There are server-side database and display components, as well as pipelines algorithms bound together with middleware. Core frameworks, like afw, are included. The client-side Butler is included. Middleware that is integral to the lsst python package, like logging, is included. The backend counterparts, like an ELK stack to receive log messages is not included. Tasks and other algorithmic components are included. Display packages are included, like display_firefly, though Firefly itself is not. Observatory interfaces maintained by DM are included. Despite being in the lsst namespace, LSST Simulations software is not included since it is managed and versioned separately. This could be redressed in the future, given how tightly coupled the DM and Simulations software is. This package collection crosses DM team lines, but reflects how the software is used, and how it can be maintained as an open source project into the future. A related issue is the name of the software product itself. This segment of the Data Management System does not have name; while the name “Stack” is often used, that refers to all software in the DMS. This technote uses the branding “LSST Science Pipelines” and “pipelines.lsst.io,” though technically this is an appropriation of the collective name of work by the University of Washington and Princeton teams. The Science Pipelines product and documentation site also includes elements from the Data Access, Science User Interface Toolkit, Middleware and SQuaRE teams. Overall, the product naming is an unresolved issue and we acknowledge that the pipelines.lsst.io branding may change. Build system information (lsst-build, lsstsw). How to create packages in lsst. How to write tests in the lsst. Keeping policies like these in developer.lsst.io allows them to be centrally referenced by other DM projects. The tight focus of pipelines.lsst.io necessitates other DM user guide projects. This is anticipated by LDM-493. Alert Production user guide (for services and scientists that consume the alert stream). Data Release documentation projects, archived for each data release (DR1, DR2, and so on). Note that the alert and data release documentation will consume the Science Pipelines documentation: those projects will describe pipelines built from the LSST Science Pipelines and use the algorithmic descriptions published with the pipelines code on pipelines.lsst.io. Finally, there will be operations guides that, like developer.lsst.io, document internal processes for operating LSST. Audience needs drive design. In this documentation design exercise, we attempted to identify who the core users of the LSST Science Pipelines are, and what their documentation needs are. Complete and accurate API references. Currently developers learn by introspecting APIs and reading other code and tests that consume an API. The current Doxygen site is not useful. Descriptions of how tasks fit together; both API-wise and from a high-level algorithmic perspective. Tutorials and other documentation for running pipelines on validation clusters. Construction-era science collaborations. We find that most astronomers using the LSST Science Pipelines are not processing data, but rather are using it as a core library for the Simulations stack (such as the Metrics Analysis Framework to motivate the Observing Strategy Whitepaper). Developer documentation (to support their own package development). Algorithm background (to comment on). Documentation on how to run pipelines on their own infrastructure. LSST operators and scientists in operations. The Science Directorate will have very similar needs to DM developers now. DRP will need documentation on how the Science Pipelines work, but will augment this with internal operations guides (which are out of scope). Astronomers using the LSST Science Platform in operations. To some extent, LSST usage will be similar to that seen for SDSS: small queries to subset data; complex queries to get objects of interest. Astronomers will want to run pipeline tasks on a subset of data with customized algorithms. Astronomers will use the Butler to get and put datasets within their storage quota. Astronomers will develop and test algorithms that may be proposed for incorporation in DRP (though an atypical scenario). We conclude that DM is the most active user group, and also has the greatest documentation needs. The needs of other groups are consistent with DM’s. From a user research perspective this is useful. If we build pipelines.lsst.io with DM’s own needs in mind, the documentation will also be immediately useful for other groups. As the project matures, we can add tutorial documentation to help other user groups. The Science Pipelines documentation uses a documentation-as-code architecture. Documentation is stored and versioned in pipelines package repositories and built by DM’s standard continuous integration system with Sphinx into a static HTML site that is published to the web with LSST the Docs. This section outlines the basic technical design of the Science Pipelines documentation, including the layout of documentation in packages, and the system for linking package documentation into the root pipelines_lsst_io project. Release notes and other project-wide documentation. Homepages for the processing topics. Homepages for the framework topics. Most content, however, is stored in the Git repositories of individual packages and linked into the pipelines_lsst_io project at build time, as described in the following section. pipelines_lsst_io is an EUPS package itself and includes a ups/pipelines_lsst_io.table file. We use the table file to manage the list of packages that the Science Pipelines documentation project covers. By using the EUPS setup command, the documentation build system can activate the correct set and versions of packages to build the Science Pipelines documentation. Each EUPS-managed LSST Science Pipelines package includes a doc/ directory that contains documentation specific to that package. The arrangement of documentation within the doc/ directory is motivated by the need to have package documentation mesh into the root pipelines_lsst_io project. Documentation for Python modules, such as lsst.afw.table, and their corresponding C++ namespaces. This documentation content is oriented towards the code base, APIs, and its usage. The bulk of Science Pipelines documentation is organized around Python modules. We describe this content further in 9 Module topic type. Documentation for the package. This documentation concerns the Git repository itself. This type of content is used in packages that do not provide a Python module, such as afwdata and verify_metrics. We describe this content in 11 Package topic type. Each module’s documentation is contained in a directory named after the Python namespace of the module itself. For example, doc/lsst.afw.cameraGeom. The _static/afw/ directory hosts static files for the package’s documentation. In Sphinx, “static” files are directly copied to the output built without intermediate processing. These could be PDFs or tarball downloads. This static content is stored in a _static/ directory. So that static content from all packages can be integrated, each package must store static content in a sub-directory of the _static directory, such as _static/afw. Data-only packages do not have module documentation directories since they do not provide Python modules or C++ namespaces. Each package also has doc/conf.py and doc/index.rst files, these facilitate single-package development builds. Finally, the doc/manifest.yaml file facilitates integrated documentation builds, as described in the next section. The doc/ directory was already used by the previous Doxygen-based documentation build system. However, during the transition from Doxygen to Sphinx-based builds, we do not expect any conflicts since content for the two system reside in non-overlapping files (.dox versus .rst files for Doxygen and Sphinx, respectively). It should be possible to continue to build a Doxygen version of the documentation while the new Sphinx site is being prepared. Module documentation directories are symlinked into pipelines_lsst_io’s modules/ directory. Likewise, package documentation directories are symlinked into pipelines_lsst_io’s packages/ directory. With all documentation content directories linked into the pipelines_lsst_io directory, Sphinx is able to build the LSST Science Pipelines documentation as if it were a unified project. # same as Python namespaces. The tool responsible for linking package documentation and running the Sphinx build is stack-docs, included in the documenteer project. Developers can build documentation for individual cloned packages by running package-docs from the command line, a tool included in the documenteer project. Developers will build documentation for individual packages in development environments to preview changes to module documentation, including conceptual topics, examples, tasks, and API references. The Doxygen-based build system uses a scons doc build command. This command (notwithstanding a likely rename to scons doxygen) will remain to support Doxygen generation of C++ API metadata. The stack-docs and package-docs commands replace the make html and sphinx-build drivers normally used for Sphinx documentation. By integrating with Sphinx’s internal Python APIs we avoid having to maintain separate Makefile files in each package to configure the Sphinx build. Instead, Sphinx configuration is centrally managed in SQuaRE’s documenteer package. The single package documentation builds omit content from related packages, but will generate warnings about links to non-existent content. This is an acceptable trade-off for a development environment. In the continuous integration environment, where all documentation content is available, documentation builds can be configured to fail on broken links. The Science Pipelines documentation, following the proposed LDM-493 Data Management Documentation Architecture, will use topic-based content organization. In this approach, content is organized into self-contained, well-structured pieces that support a reader’s current task, and that link the reader to other topics for related information. Topic-based content differs from books, research articles, and indeed, paper manuals, where a reader is expected to gradually accumulate knowledge and context through a preset narrative. In topic-based documentation, readers drop into specific pages to support a specific objective, but can follow links to establish context, and in effect, build a personalized curriculum for learning and using the software. The topic-based documentation approach is widely employed by the technical writing community. Help sites from companies like GitHub and Slack use topic-based documentation. Open source projects like Astropy also use elements of topic-based documentation philosophy. Wikipedia is an excellent example of organically-evolving topic-based documentation. The (currently proposed) LDM-493 Data Management Documentation Architecture also identifies topic-based documentation as the information architecture of DM’s user guides. Every Page is Page One by Mark Baker, hereafter referred to as EPPO, describes the motivation and principles of topic-based documentation. This section is intended to brief the Data Management team on topic-based documentation concepts, following EPPO. Baker, Mark. Every page is page one: topic-based writing for technical communication and the web. Laguna Hills, CA: XML Press, 2013. 2. Specific and limited purpose. 5. Assume the reader is qualified. 5. Stay on one level. In this planning exercise, principle #3 is immediately relevant. Topic types are predefined structures for documentation, and every implemented topic page inherits from one of these types. For writers, topic types are valuable since provide a strong template into which the domain expert’s knowledge can be filled. Topic types are also valuable to readers since they provide systematic patterns that can be learned and used as wayfinding. For example, Numpydoc Python API references are built on a topic type (perhaps a few, for classes and for function and for indices). Authors immediately know how to write a Python API references, and readers immediately know how to use a Python API reference page when they see one. Defining topic types requires us to identify every kind of documentation we will write (alternatively, each kind of thing that must be documented). Then the topic type can be implemented as a template given to authors. The template itself imbues topic instances with many of the characteristics of an EPPO topic, but should be backed up with authoring instructions. In the 6 Designing the homepage section of this technote we identify the Science Pipeline’s primary topic types, and those types are designed in later sections. Known related documents that the page can link to, rather than duplicate. Thus many authors can work on separate topics in parallel, knowing that each topic conforms to a uniform type pattern, and is supported by other topics. In software architecture parlance, topics have well-defined interfaces. Topic-based documentation can be much more effectively planned and managed than traditional narrative writing. Identifying an inventory of topic types requires foresight of what the Science Pipelines documentation will become. We approached this by first designing the homepage for the Science Pipelines documentation. The homepage provides a unique, overarching view into the inventory of content needed to document the full domain of the Science Pipelines for all expected audiences. We envision four distinct areas on the homepage: preliminaries, processing, frameworks, and modules. Each area organizes and links to topics of distinct types. The following sub-sections motivate each area of the homepage, while later sections describe the design of each topic type in greater detail. Figure 1 Mockup of the Science Pipelines documentation homepage layout. A blurb that introduces readers to the Science Pipelines. Links to installation topics, and EUPS usage topics. Links to release note topics. An invitation to try a quick tutorial that helps a reader understand what the Science Pipelines feel like to use. Links to topics describing how to contribute to the LSST Science Pipelines. An explanation of how to get help with the LSST Science Pipelines (that is, link to https://community.lsst.org). In summary, this section establishes the LSST Science Pipelines as an open source software project. A common task for readers (both community end users, and indeed, the DM team itself) is to use the Science Pipelines. This is a distinct viewpoint from documenting the Science Pipelines’s implementation (modules, and frameworks). Rather, the processing section focuses on how to organize data, use command line tasks to process data, and consume those outputs for scientific investigations. And while topics in the processing section defer to task topics as definitive self-contained scientific descriptions of algorithms, the processing section is used to frame these command line tasks and help astronomers make judgments about how they are used for science. Data ingest. Organizing Butler repositories for different observatories. Single frame processing. This is primarily an introduction to ProcessCcdTask. Postprocessing. This is a discussion of output catalogs, and may need more fine-grained topical organization. On the homepage, each listed context is a link to a processing topic. While LDM-151’s sectioning makes sense for motivating algorithm development (LDM-151’s purpose), we believe that real-world usage warrants our sugggested organization of the processing section. By organizing topics around frameworks, we have a platform to discuss their functionality for both end users (how to use the framework’s features) and developers (patterns for developing in and with the framework) in a way that’s not constrained by implementation details (module organization). The frameworks section of the homepage lists each framework’s name, along with a descriptive subtitle. Each item is a link to a corresponding framework topic. This section of the homepage is a comprehensive listing of modules in the LSST Science Pipelines. Each item is a link to a corresponding module topic. This listing will be heavily used by developers seeking API references for the modules they are using on a day-to-day basis. These module topics are imported from the doc/ directories of each Science Pipelines EUPS package. The homepage’s module listing can be automatically compiled in a custom reStructuredText directive. The final section of the homepage is a comprehensive listing of EUPS packages in the LSST Science Pipelines. Each item is a link to a corresponding package topic. This package documentation is useful for developers who are working with Git repositories and individual EUPS packages in the LSST Science Pipelines. Like modules, these package topics are provided by the packages themselves. Processing topics are a practical platform that discuss how to calibrate, process, and measure astronomy datasets with the LSST Science Pipelines. As discussed in 6 Designing the homepage, processing is organized around contexts, such as single frames, coaddition, or difference imaging. Each processing context has a main page that conforms to the processing topic type. Figure 2 Mockup of processing topics. Explain what the processing context means in non-jargon language. What data goes in? What data comes out? Link to adjacent processing contexts. For example, a single frame processing topic should mention and link to the data ingest topic. Mention and link to the main command line tasks used in this context. Suggest and link to an introductory tutorial for this processing context. This section lists and links (as a toctree) to separate topic pages. Each of these self-contained topics provide in-depth background into aspects of processing in this context. They should primarily be written as narrative glue to other types of documentation, including frameworks, tasks, and modules. That is, these topics are guides into understanding the Science Pipelines from a practical data processing perspective. The first in depth topic should be an ‘Overview’ that describes the processing context itself, and introduces other in-depth topics and tutorials. Based on experience from Twinkles, many of these topics can be divided into two halves: processing data in this context, and measuring objects from the products of that processing. Processing topic pages have the flexibility to organize in depth topics (and tutorials, below) around themes like this. The Tutorials section links (as a toctree) to tutorial topic pages that demonstrate processing real datasets in this context. These tutorials should be easily reproduced and run by readers; necessary example datasets should be provided. These tutorials might be designed to be run as a series across several processing contexts. For example, a tutorial on ingesting a dataset in the “ingest” context may be a prerequisite for a processCcd tutorial in a “single frame processing” context. Command line tasks are the primary interface for processing data with the Science Pipelines. This final section in a processing topic lists all command line tasks associated with that processing context. Links in this toctree are to task topics. Note that only command line tasks associated with a context are listed here. Processing topics are designed to be approachable for end users of the Science Pipelines. Command line tasks are immediately usable, while sub-tasks are only details for configuration (that is, re-targettable sub tasks) or for developers of new pipelines. Thus mentioning only command line tasks gives users a curated list of runnable tasks. As a user gains experience with command line tasks like processCcd.py, they will gradually learn about sub-tasks through links built into the task topic design. This pathway graduates a person from being a new to experienced user and even potentially a developer. Frameworks in the LSST Science Pipelines are collections of modules that provide coherent functionality. Rather than only documenting modules in isolation, the framework topic type is a platform for documenting overall concepts, design, and usage patterns for these frameworks that cross module bounds. Examples of frameworks were listed earlier in the homepage design section. Figure 3 Mockup of the framework topic type. The title of the framework’s topic is simply the name of the framework itself. Following the title, the initial few paragraphs of the topic should establish context. A context paragraph establishes what the framework is for, and what the framework’s primary features or capabilities are. This section provides a table of contents (toctree) for additional topics that cover individual framework concepts. Concept topics can include guides for developing against the framework, and descriptions of the basic ideas implemented by the framework. ‘Concept‘ is purposefully ambiguous but we require that concept topic pages follow the design principles of topic-based documentation. Generally, the first topic should be an overview. The overview topic’s narrative introduces and links to other framework topics. The Tutorials section provides a table of contents (toctree) linking to separate tutorial topic pages. These tutorials demonstrate and teach how to use and develop in the framework. Additional design work is required for tutorial topic types. This section lists and links to the module topic of all modules included in a framework. These links establish a connection between the high-level ideas in a framework’s documentation with lower-level developer-oriented details in a module’s documentation. The components described above are a minimum set used by each framework topic. Some frameworks may add additional components. For example, the measurement framework might include an index of all measurement plugins. The task framework might include an index of all tasks. The module topic type comprehensively documents a module as an entrypoint to task and API references associated with a specific part of the codebase. Module topics are the index.rst files in the module documentation directories of packages. Figure 4 Mockup of module topic types. lsst.afw.table — Table data structures. This paragraph establishes the context of this module and lists key features. This section is intended to help a reader determine whether this module is relevant to their task. Right after the summary paragraph, and within a seealso directive, this component links to other parts of the documentation that do not otherwise follow from the topic type design. For example, if the module is part of a framework, that framework’s page is linked from here. This component can also be used to disambiguate commonly-confused modules. This section lists and links to conceptual documentation pages for the module. Each conceptual documentation page focuses on a specific part of the API and dives into features while providing usage examples. The topics can also document architectural decisions. These pages are similar to the conceptual documentation provided in the “Using” sections of Astropy sub-packages (see Using table for examples). The lsst.validate.base prototype documentation (currently available at https://validate-base.lsst.io) includes examples of such conceptual documentation pages as well. This section lists and links to task topics for any tasks implemented by this module. The task topic type is discussed in 10 Task topic type. Minimally, this section should be a simple list where the task name is included first as a link, followed by a short summary sentence. It may be useful to distinguish tasks usable as command line tasks from plain tasks. Perhaps the two types could be listed separately, with command line tasks appearing first. These sections list and link to reference pages for all Python and C++ API objects. Individual functions and classes are documented on separate pages. See 12 API Reference Documentation Prototypes for a discussion of API reference pages. For the last item, we envision a service that can monitor https://community.lsst.org forum conversations for mentions of pre-defined keywords and automatically populate a list of related forum posts. Linking documentation to the Community forum will help make the documentation interactive. With minimal overhead, a reader can begin to discuss and ask questions about documentation and the LSST Science Pipelines. The task topic type defines how tasks in the LSST Science Pipelines are documented. Tasks are basic algorithmic units that are assembled into processing pipelines. Astronomers will use task topics to understand these algorithms and identify implications for their science. Users will refer to task topics to learn how to configure and run pipelines. Developers will use task topics to learn how to connect tasks into pipelines. Thus these topics are important for both astronomy end users and developers. Currently the Science Pipelines have two flavors of tasks: tasks, and command line tasks. Though command line tasks have additional capabilities over plain tasks, those capabilities are strict supersets over the regular task framework. In other words, a command line task is also a task. The topic type design reflects this by making no significant distinction between tasks and command line tasks with two design principles. First, command line task topics will have additional sections. Second, tasks and counterpart command line tasks are documented as the same identity. Soon, a new SuperTask framework will replace command line tasks (though like command line tasks, they are still subclasses of a base Task class). SuperTasks will allow a task to be activated from a variety of contexts, from command line to cluster workflows. By documenting the core task and extending that documentation with additional ‘activation’ details, the task topic type should gracefully evolve with the SuperTask framework’s introduction. This topic design replaces earlier patterns for documenting tasks. Archives of documentation for the previous system are included in this technote. How to Document a Task (Confluence; September 23, 2014). AstrometryTask: example of task documentation implemented in Doxygen. Figure 5 Mockup of the task topic type. We should monitor how the SuperTask command line activator refers to tasks; it may make sense for SuperTasks to always use the task’s class name rather than use an alternate form. A summary is already provided with the 10.2 Summary sentence component, but including a summary in the title may improve the usability of the task listing from module topics and processing topic pages. This sentence, appearing directly below the title, has two goals: indicate that the page is for a task, and succinctly describe what the task does. This sentence is important for establishing context; readers should be able to use this sentence to quickly determine if the page is relevant to their task. Appearing after the summary sentence as one or more distinct paragraphs and lists, this component provides additional details about what the task does. A processing sketch might list the methods and sub-tasks called, in order or execution. Mentions of methods and sub-tasks should be linked to the API reference and task topic pages, respectively, for those objects. Like the summary sentence, this component is intended to quickly establish the task’s context. This sketch should not be extensive; detailed academic discussion of an algorithm and technical implementation should be deferred to the 10.12 Algorithm notes component. AstrometryTask is part of the lsst.meas.astrom.astrometry module. The module mention is a link to the module’s topic. This component establishes the task’s code context, which is useful for developers. Tasks that commonly use this task (this helps a reader landing on a “sub task’s” page find the appropriate driver task). Tasks that can be used instead of this task (to link families of sub tasks). Pages in the Processing and Frameworks sections of the Science Pipelines documentation. Parameter type. Ideally the parameter type links to a documentation topic for that type (such as a class’s API reference). A description sentence or paragraph. The description should mention default values, caveats, and possibly an example. We anticipate that a reStructuredText directive can be built to automatically generate this topic component. The entrypoint section documents the task’s ‘run’ method. Note that task run methods are not necessarily named ‘run,’ nor do they necessarily share a uniform interface. (with the namespace linked to the method’s API reference). Later, a custom directive may automatically replicate information from the method’s API reference and insert it into the Entrypoint section (recall that topics should be self-contained). We may also need to add a section on Task class initialization. This section documents datasets that this task (as a command line task) consumes from the Butler. 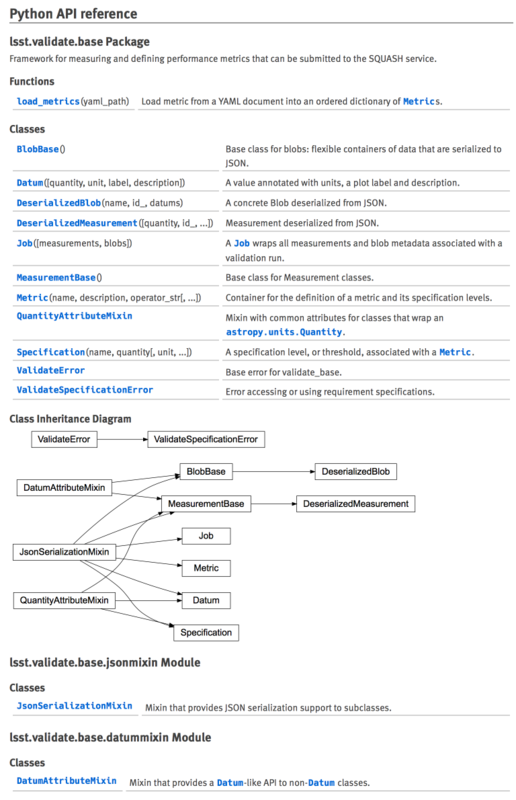 Dataset type (linked to the dataset type’s class documentation). We anticipate that the SuperTask framework will provide hooks for auto-documenting this. Again, we anticipate that the SuperTask framework will provide hooks for auto-documenting this. The section provides one or more runnable examples that demonstrate both the task’s usage within Python, and from teh command line. Test data sets to run the example should be documented and made accessible to the reader. The example should be runnable by a reader within minimal work. That is, the example includes all surrounding boilerplate. The example should also be runnable from a continuous integrated context, with verifiable outputs. Where an example includes a large amount of boilerplate, it should be possible to highlight the parts most relevant to the task itself. - exampleModule.py — Description of the example. Variable type (linking to the type’s API reference). Free-form description. The description should indicate default values, and if the variable is a complex type, include an example. This section also includes a link to the debug framework’s topic page so that the debug framework itself isn’t re-documented in every task page. This section can contain extended discussion about an algorithm. Mathematical derivations, figures, algorithm workflow diagrams, and literature citations can all be included in the Algorithm notes section. Note that this section is the definitive scientific description of an algorithm. Docstrings of methods and functions that (at least partially) implement an algorithm can defer to this section. This design makes it easier for scientific users to understand algorithms without following method call paths, while allowing method and function docstrings to focus on technical implementation details (such as arguments, returns, exceptions, and so forth). The package topic type documents individual stack packages (Git repositories) that do not provide Python modules. This topic type is the index.rst file at the of package documentation directories. JIRA component for issue reporting. In the Science Pipelines documentation project, API references are collections of topics that document, in a highly structured format, how to program against the Python and C++ codebase. Following the docs-as-code pattern, documentation content is written in, and extracted from the codebase itself. We use Numpydoc format for Python API documentation, with a toolchain extended from Astropy’s astropy-helpers. For C++, Doxygen inspects the API and code comments to generate an XML file that is processed with breathe into reStructuredText content that is built by Sphinx. This section describes the prototype implementations of the API documentation infrastructure with two packages: daf_base, and validate_base. Section 12.1 Prototype Python API reference implementation for validate_base describes the case of validate_base, a pure-Python package with extensive documentation written in Numpydoc. Section 12.2 Prototype SWIG-wrapped Python API reference for daf_base describes Python documentation in daf_base, where many of the Python APIs are implemented in C++ and wrapped with SWIG. Finally, Section 12.3 Prototype C++ API reference in daf_base describes C++ API documentation in daf_base generated with Doxygen and Breathe. This prototype work was performed in tickets DM-7094 and DM-7095. lsst.validate.base is a useful prototype for Python API reference documentation since it is pure-Python and was originally written with well-formatted Numpydoc docstrings. Collects all functions and classes in a module and generates API references pages for them. Builds a table of contents in situ. Builds a class inheritance diagram. Modules should only export public APIs, using __all__. Sub-package __init__ files should import the APIs of modules to create a cohesive API organization. In validate_base, most APIs are imported into the __init__.py module of lsst.validate.base. The lsst.validate.base.jsonmixin and lsst.validate.base.datummixin modules were not imported into lsst.validate.base because they are private APIs, yet still need to be documented. Figure 6 lsst.validate.base API contents on the module topic page. As mentioned, automodapi also creates API reference pages. Each function and class is documented on a separate page. Figure 7 shows the reference page for the lsst.validate.base.Metric class. Figure 7 lsst.validate.base.Metric class API page, generated by Numpydoc. Compared to Breathe’s HTML output that builds unified references for all API objects in a module, automodapi documents each function and class in separate pages. This choice by Astropy is effective because well-documented classes tend to already have long pages (see lsst.validate.base.Metric class API page, generated by Numpydoc. ); mixing several classes on the same page would create confusion about an API object’s class membership as a user scrolls. The means of crafting API reference content for individual classes and functions is already well resolved. automodapi uses Numpydoc to extract docstrings from code and build well-formatted reference pages. DM’s usage of Numpydoc is already well-documented in the Developer Guide, and approved for use in RFC-214. This documentation approach may alter some classes by requiring attribute declarations at the class scope, rather than only during __init__. However, the outcome is highly useful documentation where all attributes, even class properties are documented together, as in Figure 8. Figure 8 Attributes table (left) and expanded documentation (right) in lsst.validate.base.Metric. Note that regular attributes, like name, are documented alongside attributes implemented as properties, like json. See also Figure 6 where attribute documentation is shown in the context of the full lsst.validate.base.Metric reference page. In summary, the Python API reference infrastructure created by the Numpy (Numpydoc) and Astropy (automodapi) projects is eminently usable for the Science Pipelines documentation without any modifications. The Python APIs of lsst.daf.base are more difficult to generate documentation for since they are not implemented in Python, but rather wrapped with SWIG. This means that the API will generally be non idiomatic, and docstrings do not conform to Numpydoc. Note the extensive curation of the Python namespace required for the wrapped lsst.daf.base API. SWIG clutters the Python namespace, making it difficult to automatically identify relevant APIs to document. Figure 9 shows the lsst.daf.base API reference contents on its module page. Figure 9 Module page for lsst.daf.base in the DM-7094/DM-7095 prototyping. The Python API reference section is built with Numpydoc’s automodapi (12.2 Prototype SWIG-wrapped Python API reference for daf_base), while the C++ section is assembled from a toctree of manually-built pages containing doxygenclass directives (12.3 Prototype C++ API reference in daf_base). The generated API reference page for a SWIG-wrapped Python class (lsst.daf.base.Citizen) is shown in Figure 10. Compared to a Python API documented in Numpydoc, the docstrings generated by SWIG are not useful. Additional work, outside the scope of this document, is needed to establish how Python APIs implemented from C++ should be documented. Meanwhile, note that Numpydoc still renders poorly-formed docstrings (albeit, with Sphinx warnings). This will be useful during early implementation of the Science Pipelines documentation site. Figure 10 lsst.daf.base.Citizen Python API reference page, generated from Numpydoc, of the SWIG-wrapped lsst::daf::base::Citizen C++ class. This section explores the prototype API reference documentation for the C++ package lsst::daf::base. In this case, the C++ source and Doxygen-formatted comments are processed by Doxygen, which yields XML files describing the API (XML is a Doxygen output generated by sconsUtils in addition to HTML). When the Sphinx project is built, Breathe uses these XML files to generate reStructuredText content. Mechanisms for configuring Breathe to find the appropriate XML are already included in documenteer.sphinxconfig.stackconf. Like automodapi, Breathe provides a doxygennamespace directive that generates documentation for an entire C++ namespace (like lsst::daf::base). Unlike automodapi, though, this directive inserts all API documentation for the namespace in situ, rather than creating and linking to API reference pages for individual API objects. The output of this toctree is shown in Figure 9 (right). Figure 11 lsst::daf::base::Citizen API reference page, generated from breath’s doxygenclass directive. As Figure 11 shows, C++ class documentation rendered this way is still not as useful as the pure-Python documentation. One reason is that the Breathe output is not typeset as strongly as Numpydoc output is. Better CSS support could help with this. Second, the comment strings written for Figure 11 itself are not as comprehensive as those for lsst.validate.base Python classes. Better C++ documentation standards will help improve content quality (see DM-7891 for an effort to address this). In review, the Science Pipelines documentation has three distinct types of API references: pure-Python, wrapped Python, and C++ APIs. Numpydoc and automodapi are excellent off-the-shelf solutions for generating documentation for Python APIs. The latter two modes require additional engineering. Improved C++ Doxygen documentation standards. Better CSS formatting of doxygenclass directive output. Development of a custom directive that emulates automodapi by automatically scraping a C++ namespace and generating individual documentation, but still uses doxygenclass. Generating reference documentation for Python APIs implemented in C++ will be the most difficult challenge. We will address this separately, in conjunction with LSST’s migration from SWIG to Pybind11. © Copyright 2016, Association of Universities for Research in Astronomy. Last updated on Jul 13, 2018.